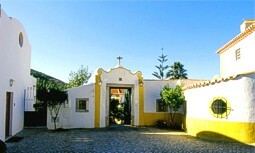 Accommodation at Quinta do Rio Touro. Quinta do Rio Touro is a farm of 3 hectares located near Azoia, a short drive from Cabo da Roca, the most westerly point in mainland Europe. The quinta is within the Sintra/Cascais Natural Park half way between the historic center of Sintra, and the picturesque town of Cascais yet not far from Lisbon. The town of Sintra with its castles and palaces is classified by UNESCO as World Heritage Site. The Quinta is encircled by the hills giving a Mediterranean micro climate but with the cooler air of the Atlantic coast. The valley is full of luxuriant sub-tropical vegetation. A small river, the Rio Touro runs down the valley to the nearby sea. The owner was formerly one of the senior Portuguese Ambassadors. The house is full of momentos of his postings in various capitals of the world including Paris, Tokyo, Oslo, Geneva, Madrid and New York. The Ambassador bought the quinta in 1994 and since then there has been extensive renovation to give today's charming house that retains the original traditional architecture. There are two family luxury suites and two double bedrooms in the Manor House. AZENHA - Double bedroom, a dressing room with a sofa bed, en suite bathroom with jacuzzi bath, small lounge, balcony and terrace. Panoramic views, glimpse of the sea. ACOTEIA - Junior suite, twin bedded room with en suite complete bathroom and private terrace overlooking the garden. BIBLIOTECA - Double bedroom, complete en suite bathroom. Living room with sofa bed suitable for two children. Panoramic views. MIRA RIO - Spacious double bedroom with complete bathroom. LIMAO Suite is located on the ground floor and has a living room with open fireplace, Satellite televison and two sofa chairs. The small kitchenette is equipped with a fridge/freezer, electric cooker with 2 rings, microwave, toaster and kettle. Dining table for up to 6 persons. A twin bedroom and adjacent bathroom. LIMA Suite is located on the first floor and has a twin bedroom and a small lounge. Small terrace and an upper level solarium. View of the sea and valley. DAI NIPPON has a double bedroom featuring Japanese decoration. It has shower room. LARANJA ROOM has one double bedroom, bunked beds and a shower room. Suitable for 2 adults and 2 children. 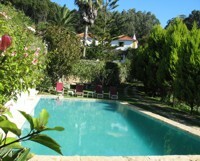 Guests have the use of the living rooms, patio, terraces, swimming pool, gardens and the farm. The owners have an extensive book collection, in many languages and covering many subjects which reflect their own personal interests. More than a thousand books are at guest's disposal. The owners are very keen on the ecological environment and it is hoped that the production will soon be certified as organic. Pesticide free fruits and vegetables flourish in the naturally fertilized gardens. The landscape features a plantation of thousand lime trees. There are also other fruit trees, many pine and other specimen trees which are native to the area. The swimming pool has a feature designed by the owners daughter who is an architect. It is set in the lawned gardens, with views down the valley. It is surrounded by pear, apple, fig, peach and orange trees. Trekking and jogging can be done inside the farm or on the hills and cliffs leading to the sea. Bike and jeep tours, horseback riding can also be arranged. In the vicinity, there are many restaurants of the luxe or bistro type, most specializing in seafood, on the village of Azoia, about 300 yards from the Quinta. Nearby there are extensive and small sandy beaches. Bathing, windsurfing, fishing and sailing is possible. The house is about a 40 minutes drive from Lisbon. To the south is the bustling old fishing village of Cascais which has now grown to a bustling holiday resort with an international reputation. Guests are kindly asked not to smoke inside the house. We stayed at Quinta do Rio Touro in Sintra for two nights at the beginning of our 10-day stay in Portugal. It was great. The house and room were charming and the hosts were very gracious. We loved it so much we tacked on two more nights at the end of our trip. Highly recommended.